Clyde Kilby, in C. S. Lewis: Images of His World, stated that C. S. Lewis was “fascinated by the ancient monument of Stonehenge, near Amesbury, Wiltshire”. Of course, countless people have been intrigued by Stonehenge because it is a 5000 year old mystery. What was the original purpose of this circular enclosure of “hanging stones”? Was it used for human sacrifice? Some have speculated that Lewis based his Stone Table, in The Lion, the Witch and the Wardrobe, on Stonehenge. However, that speculation is unlikely to be true. Far more likely is the thought that Lewis derived the idea for the Narnian Stone Table from the Dolmens of his native Ireland. And archaeological experts on Stonehenge have found no evidence of human or animal sacrifice there. So what was the purpose of Stonehenge: place of worship, astrological calendar? No one knows for certain. No the Meagre One was not born with a squint: but long, long, long ago, so long ago that Stonehenge had a roof and walls & was a new built temple, he killed a spider. The good people of his day, outraged at this barbarity, stuck a dagger thro his nerve centre which paralyzed him without making him unconscious, seated him on the altar at St. Henge’s temple & locked him up with the spiders son. The latter began to spin a solid mass of cobwebs from the Opposite corner. Very very slowly through countless years the web grew while the poor Meagre One—who couldn’t die—developed a squint from watching it get nearer. At last after countless ages Stonehenge disappeared under an enormous mass of web & remained thus till one day Merlin hapenned to set a match to it and so discover what was inside: hence the myth of Merlin’s having ‘built’ St. Henge’s. To this day if you go there at sunrise & run round it 7 times, looking over your shoulder you can see again the wretched prisoner trying to struggle as the horrid sticky strands close round him. Cheap excursion trains are run for those who wish to try it. On one occasion I came close to trying Lewis’s suggestion. Douglas Gresham, Lewis’s step-son, had sent me on an overnight trip from Ireland to England to fetch a van-load of books for him. I was driving down a deserted highway, not too far from Stonehenge, in the darkness of a very early summer morning. I was tempted to take a detour, just to see St. Henge’s, as Lewis calls it, by the eerie light of the moon with no one else around. However, I decided against it. The thought of it all seemed just a bit too spooky. 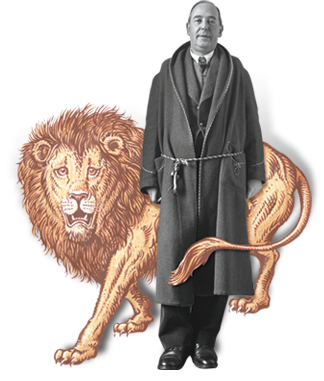 So far as we know, C. S. Lewis visited Stonehenge only once. The year was 1925, just one month prior to being elected a Fellow of Magdalen College, Oxford. Lewis traveled with his brother Warren, by motorcycle and sidecar through Wiltshire, April 6-8. Warren took a photograph on April 8, 1925 showing his brother Jack actually seated on one of the stones of Stonehenge. The trip was delightful. I was pleased to revisit Salisbury and see it more thoroughly. I well remember my former visit. ‘It was a Sunday’ and NOT very early in the morning, as you doubtless recollect, when we stopped for a few minutes in Uncle Hamilton’s headlong career and heard morning prayer going on in the Cathedral. At that time I did not agree with you and cared for it less than Wells or Winchester. This time as we came into sight of Salisbury, where, on those big rolling downs that spire can be seen from fifteen miles away, I began to have my doubts. Later, when we had had tea and strolled into the Close I decided that it was very good in its own way but not in my favourite way. But when we came out again and saw it by moonlight after supper, I was completely conquered. It was a perfect spring night with the moon nearly full, and not a breath of wind stirring nor a sound from the streets. The half light enhanced its size, and the sharp masses of shadow falling in three great patches from the three main faces of one side emphasized the extraordinary simplicity in which it differs so from say, Wells. . . .
Salisbury . . . is the idea of a master mind, struck out at once for ever. . . . The more one looks the more it satisfies. What impressed me most . . . was the force of Mind: the thousands of tons of masonry held in place by an idea, a religion: buttress, window, acres of carving, the very lifeblood of men’s work, all piled up there and gloriously USELESS from the side of the base utility for which alone we build now. It really is typical of a change—the medieval town where the shops and houses huddle at the foot of the cathedral, and the modern city where the churches huddle between the sky scraping offices and the appalling ‘stores’. Is there any question what Lewis preferred, even in 1925, the medieval town or the modern city? Ancient stones set up in a circle pointing inward or thousands of tons of masonry directing our gaze upward? Lewis’s visit to Stonehenge and Salisbury in the year of his election to Magdalen College makes one thing clear, while it would be a few more years before his reason was surrendered to Christ, his imagination had already crossed the frontier into the kingdom. Will Vaus is the author of Mere Theology: A Guide to the Thought of C. S. Lewis (InterVarsity Press, 2004) and The Professor of Narnia: The C. S. Lewis Story (Believe Books, 2008). This entry was posted in Will Vaus and tagged Clyde Kilby, Collected Letters, fantasy, narnia, Stonehenge.